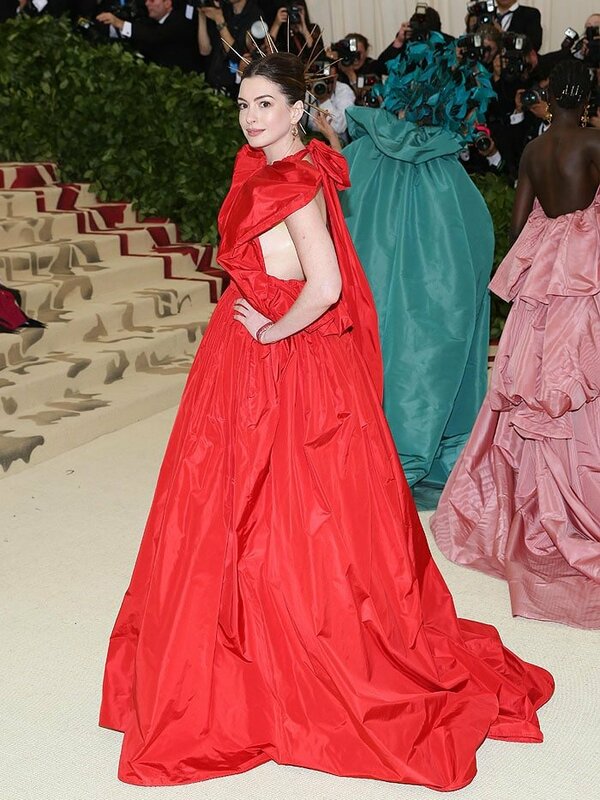 ﻿Five ladies who attended the 2018 Met Gala in red were also amazingly all head-dressed! It’s either a sartorial coincidence, or they all got such a boost of confidence from the fiery color that they decided to go even bigger and bolder with their looks. 1. Blake Lively crowned with a Lorraine Schwartz halo in an Atelier Versace ruby-red-and-gold gown. Starting off our list is Blake Lively, who was arguably the best-dressed at the 2018 Met Gala in an Atelier Versace ruby-red-and-gold gown featuring a jewel-encrusted bodice and a long train. So it was fitting that she wore a Lorraine Schwartz gold-and-diamond halo and accessorized with over $2 million worth of the jeweler’s pieces. Custom Christian Louboutin embellished-platform sandals and monsieur Christian Louboutin himself as a date completed Blake’s winning look. Blake Lively in an Atelier Versace jeweled-bodice red-and-gold gown with a long train, custom Christian Louboutin embellished peep-toe platform sandals, and Lorraine Schwartz halo and jewelry at the 2018 Met Gala held at the Metropolitan Museum of Art in New York City on May 7, 2018. 2. Nicki Minaj rocking a rosary headpiece in a custom Oscar de la Renta ombré sequined gown. Nicki Minaj used red to represent a devil temptress in her custom Oscar de la Renta ombré-red sequined gown worn with a dip-dyed tulle coat. The “Chun-Li” singer topped her sultry look with a black-and-red rosary headpiece and finished with Le Silla “Gaga” patent sandals with red mink fur on the toe straps. 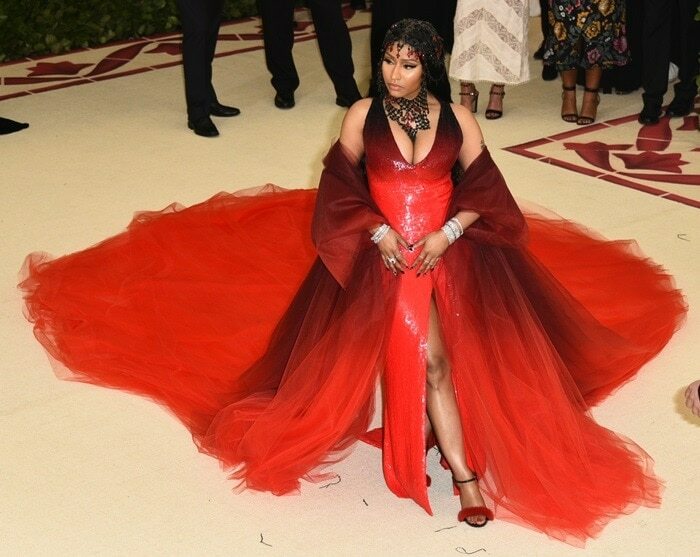 Nicki Minaj in a custom Oscar de la Renta ombré-red sequined gown, dip-dyed tulle coat, a black-and-red rosary headpiece, and Le Silla “Gaga” red-fur sandals at the 2018 Met Gala. 3. Anne Hathaway with a gold spiked halo in a Valentino ruffled halter ball gown. 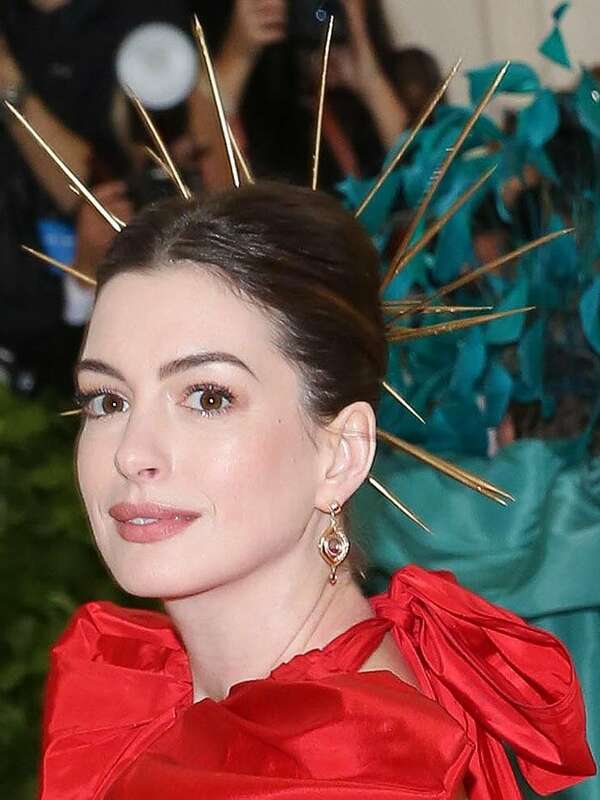 Anne Hathaway was no saint in a ragged version of a halo formed with gold spikes pierced through her updo. A Valentino Spring 2018 Couture ruffled halted ball gown and Jimmy Choo heels formed the rest of Anne’s badly behaved angel ensemble. Anne Hathaway wearing a Valentino Spring 2018 Couture ruffled halter ball gown, James Banks earrings, a The Code bracelet, a gold spiked halo, and Jimmy Choo heels at the 2018 Met Gala. 4. Amber Heard wearing a Apatico zip-tie halo in a Carolina Herrara long-sleeved gown. 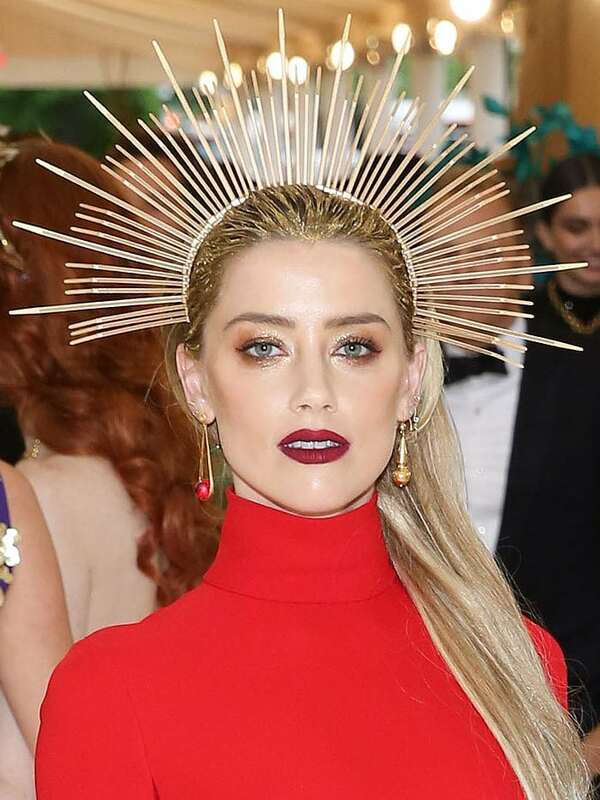 A gold-hair-painted Amber Heard got creative with her halo constructed out of zip-ties by Apatico. She used the frugal fashion piece to highlight her Carolina Herrera red long-sleeved open-back gown, Brian Atwood heels and Jennifer Meyer earrings. Amber Heard wearing a Carolina Herrera red long-sleeved open-back gown, an Apatico zip-tie halo, Jennifer Meyer jewelry, and Brian Atwood heels at the 2018 Met Gala. 5. Priyanka Chopra veiled in a jeweled hood headpiece in a Ralph Lauren velvet gown. Last but not least is Priyanka Chopra who was simply elegant in a Ralph Lauren Collection burgundy-velvet column gown with a long train. A jeweled hood headpiece and her wavy center-parted hair evoked Virgin Mary vibes that perfectly fit with the Met Gala’s “Heavenly Bodies: Fashion and the Catholic Imagination” theme. Priyanka Chopra rocking a Ralph Lauren Collection burgundy velvet column gown with a long train and a jeweled hood headpiece at the 2018 Met Gala. We got to give special mention to Ruby Rose. The heavily tattooed DJ-slash-actress donned a red, priest-robe-inspired Tommy Hilfiger dress worn with a wide velvet sash that featured a beaded crucifix on it. Although Ruby did not wear anything on her head, she did have gold crucifix jewelry dangling from her eyebrows that we found to be just as interesting as a headpiece. Ruby Rose wearing a Tommy Hilfiger red pleated dress with a velvet sash, gold Jimmy Choo Kaylee sandals, and dangling gold crucifix eyebrow jewelry at the 2018 Met Gala.